The subtle knock on the door roused me from my slumber. It was 2 a.m. and the wake-up call could only mean one thing. 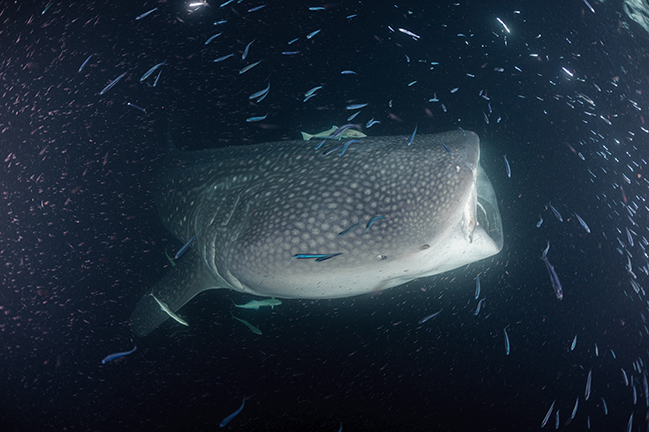 A whale shark had finally appeared to feed on the large aggregation of plankton attracted to the light set out behind the boat. I scrambled out of bed and raced upstairs to get my camera. Whale shark, Maldives. Photo by Matthew Meier. For the next hour and a half, I snorkeled alongside the largest fish in the ocean, as it gulped down mouthfuls of seawater and krill, essentially ignoring my presence as it enjoyed a free midnight snack. Almost everyone had gone back to bed by the time I emerged from the water. As if seemingly waiting for my departure, a second, smaller whale shark materialized to feed alongside the first. I watched them both from the surface, snapping a few more photos, before calling it a night. It was truly a magical evening and well worth the lack of sleep. Located on the Equator, 435 miles (700km) southwest of Sri Lanka, the island nation of the Maldives comprises 26 atolls surrounded by the Indian Ocean. Situated on the Laccadives-Chagos Ridge, a 1,243 mile (2,000km) submarine mountain chain created over 2,000 million years ago, the country is spread out over 56,000 sq mi (90,000 sq km) of ocean, though the land portion above water accounts for less than one percent of that area or 186 sq mi (300 sq km). Comprised of beautiful stretches of coral, sand and palm trees, the islands themselves are surrounded by brilliantly clear, turquoise, warm water. The topography is exceedingly flat, with the highest point in the country being a mere eight feet above sea level. Miles and miles of ocean often fill the space between islands and it is not uncommon to entirely lose sight of land, as you explore this tropical paradise. 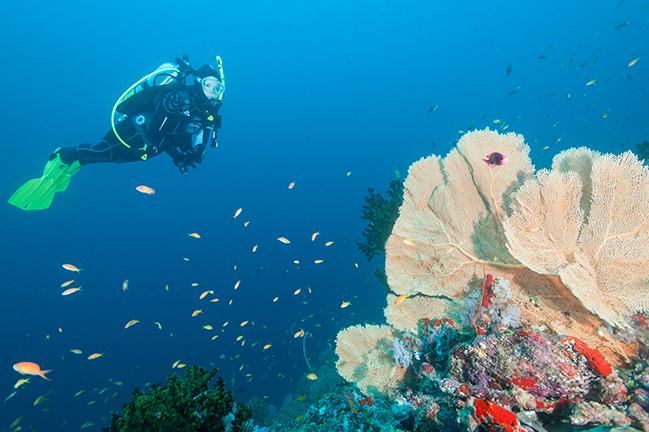 There is so little land, spread out over such a large area, that you will rarely share a dive site with other divers. Often, it feels as if you are on the only boat on an entire atoll. The weather in the Maldives is greatly influenced by the Iruvai (“dry” northeast monsoon that typically blows mid-November to April) and the Hulhangu (“wet” southwest monsoon in May to October). Though air temperatures remain fairly constant between 84-90°F (29-32°C) year-round and water temperatures fluctuate only slightly between 80-84°F (27-29°C), the monsoons affect the climate on land and in the sea. With the start of the Iruvai, underwater currents begin flowing from the northeast and visibility typically improves on the eastern edges of the atolls. Stronger currents and winds commonly define the Hulhangu, as the water flow shifts from the southwest, often bringing along with it larger algae blooms which can diminish visibility. The plus side of this is the increased food supply that often equates to intensified pelagic encounters. Getting to this remote destination can be a lengthy process. International travelers can stop in Singapore, Bangkok, Dubai or Kuala Lumpur, among others, before boarding a flight to Malé, the capital city of the Maldives. Upon arrival, most divers walk straight out of the airport and onto a water taxi, which transports them directly to their land-based resort or liveaboard. It is quite possibly the only place I have visited where I did not set foot in a car and yet still traversed more than half of the country. Whether it is swimming with whale sharks, playing with manta rays, interacting with sharks and huge schools of fish or exploring the incredible coral reefs, the Maldives has something for everyone. With one of the most diverse assortments of fish and coral species on the planet, the Maldives are a bucket-list destination for most scuba divers, and rightly so. The hard corals alone are worth the trip. I have never seen such a wide variety of healthy—and massive—hard coral formations, which in turn play host to an even greater array of colorful reef fish. There were damsels, fusiliers, chromis, butterflyfish, snappers, jacks, and endemic clownfish to name just a few. Did I forget to mention the turtles? I had lost count, there were so many turtles! 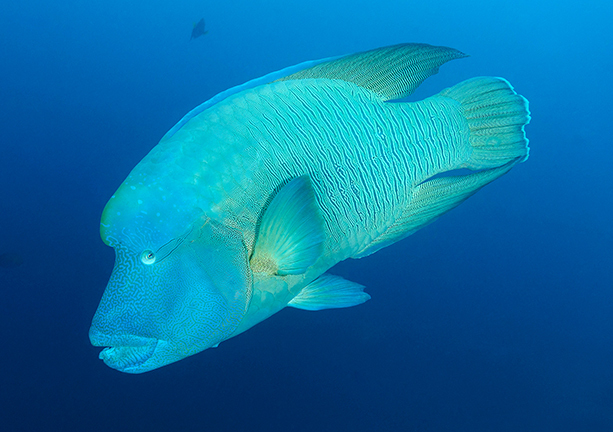 We had numerous encounters with huge Napoleon wrasse and swam alongside squadrons of eagle rays as they swayed in the current. 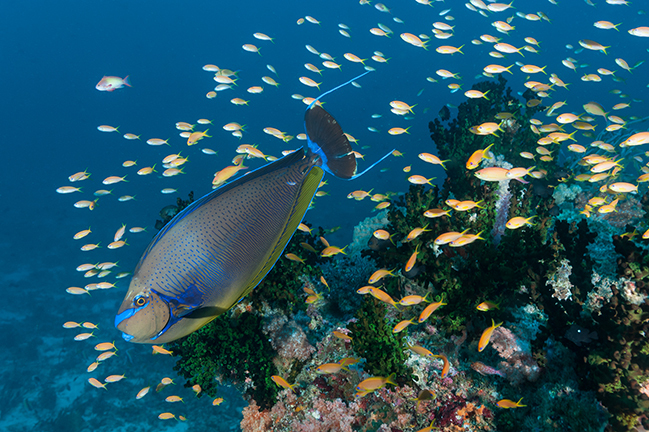 Tucked into gaps in the reef were large schools of golden sweepers and glassfish, while hiding under the monstrous plate corals were colorful sweetlips. 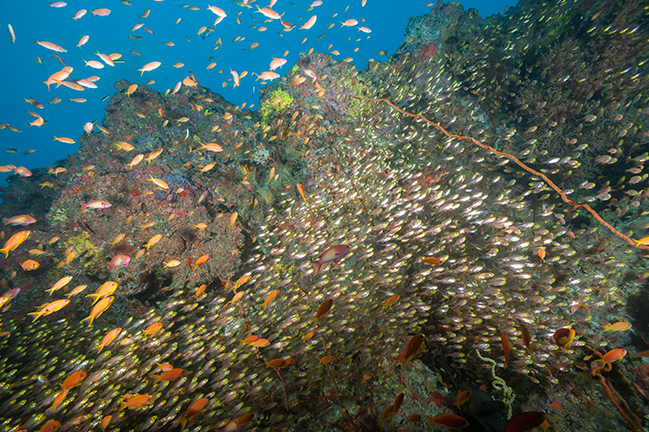 Large sea fans, dark green sun corals and colonies of black coral played host to aggregations of vibrant anthias fish. Beautiful honeycomb moray eels were found hiding amongst the coral reefs, along with sea stars, anemones, thorny oysters, shrimps, crabs and the occasional giant clam. This level of diversity tends to make a photographer giddy, but also forces one to make hard lens choices before each dive. If you are like me and shoot a housed DSLR, then you are limited to one lens for the entire dive and hope that the majority of subjects you encounter fit your selection. Here is where having a seasoned divemaster can make or break the trip for a photographer. Happily, our guides had 15 and 18 years of diving experience in the Maldives and they were able to suggest a suitable lens for nearly every dive site. Mother Nature does not always cooperate, so as with any dive trip, there were a few instances where I really wished I had made a different lens choice. Speaking of Mother Nature, she provided a sobering reminder of the ocean’s sheer power and the need to be well equipped and properly trained as a diver entering her waters. We had dropped into a late morning dive amidst a light rain and small rollers. A short 45 minutes later, we surfaced in a near blinding downpour with 3- to 5-foot waves crashing over our heads. The wind had switched direction and a storm blew in while we were underwater, causing the waves to crest in the channel. The experience reinforced the significance of staying with your buddy, having and—more importantly—knowing how to use your safety sausage, as well as coming to the surface with air in your tank. An equally fundamental lesson was having and—again—knowing how to use a snorkel, staying calm and properly utilizing the Nautilus lifeline system to locate divers. Happily, all divers were eventually recovered safely and the ordeal provided us a teachable moment to rethink our levels of preparedness. One of my more exhilarating experiences on this trip was the night dive at Alimatha Jetty. Dropping into a swift current, we used reef hooks to anchor ourselves to the patches of coral in the shallow lagoon and were soon surrounded by dozens of tawny nurse sharks and several large marble rays. 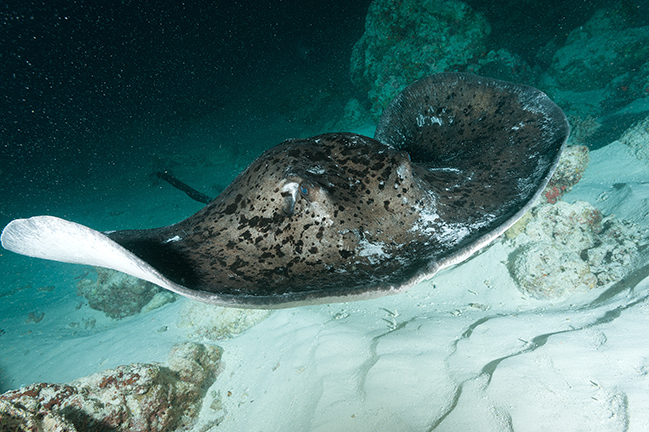 The rays were foraging for food on the bottom, while blackjacks circled in a cooperative feeding behavior, waiting for the rays to scare up food out of the sand. 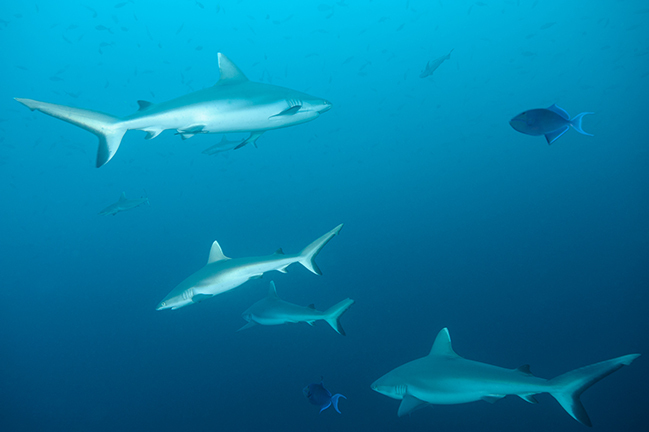 The nurse sharks alternated between cruising amongst us on the sandy bottom and schooling over our heads. We even had a few seemingly follow us back at the end of the dive to hang out at the surface in the lights behind the boat. Most liveaboards touring the central atolls visit this dive site and there can be a lot of divers underwater at the same time. If possible, I would highly recommend beginning this dive a little before nightfall, thus avoiding much of the crowds. The Southern Atolls are only accessible a few months out of the year when the wind and wave conditions allow for safe passage and the currents allow for safe diving. Typically, this is from January to March, though the past few years have seen favorable circumstances pushed farther back on the calendar due to changing weather patterns. The word "atoll" is derived from the Maldivian word atholhu; and it comprises a ring-shaped barrier reef, remnants from the sides of an extinct volcano. The reef protects a central lagoon, which is situated over the sunken caldera of the volcano. Atolls rely on coral growth, at a rate faster than the eroding volcano, to maintain their existence and are only found in tropical and sub-tropical oceans. Only a few liveaboards visit the Southern Atolls and Luxury Yachts Maldives was one of the first to make the journey in 1991. Back in the early days, airport access to the Southern Atolls was limited at best, so guests flew in and out of the capital city of Malé and then took a 15-20 day round trip tour on the boat. Now, it is possible to get local flights straight to several of the Southern Atolls, making the logistics easier and the trips more varied. Guests have the option to take one of the transit trips, visiting several of the atolls along the way or to fly into Huvadhoo (the second largest atoll in the world, by surface area), and spend their trip exploring the varied diving there. The transit trips are defined by high-energy dives in channels called a kandu, connecting the lagoons to the open ocean. These dives are typically done with an incoming tide so that the divers can ride the current into the lagoon after hooking in at the mouth of the channel to watch pelagics swimming in the blue. A reef hook is a must, as is an advanced dive certification, given that the depths of most of these channels are 80 to 90ft (24 to 27m). The Maldivians have names for their various reef structures, which are subsequently incorporated in the names of dive sites and this helps divers to visualize the underwater landscape even before hitting the water. A deep-water pass or channel was defined previously as a kandu and a faru is a circular reef within a channel that extends to the surface. 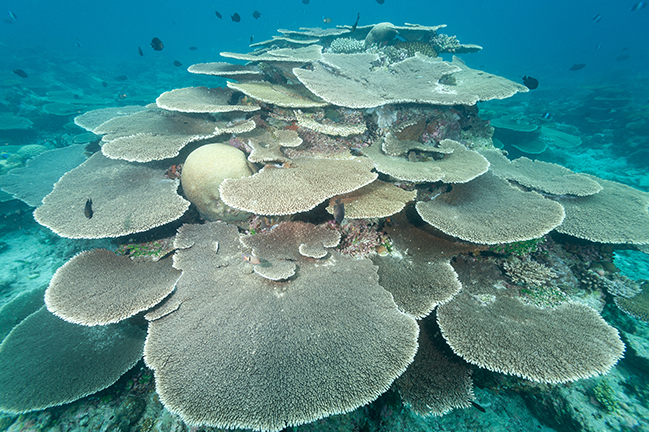 An oblong or circular reef within an atoll whose top maxes out between 20-40ft (6-12m) below the surface is called a thila. A giri is similar to a thila but is a smaller reef that reaches to within 5-10ft (1-3m) of the surface. Liveaboards in the Maldives operate differently than most other places around the globe. A separate boat called a dhoni is used as a diving platform to transport divers from the main yacht to the dive sites. These large, stable boats allow divers an easy giant-stride entry, have large rinse tanks for camera gear, provide ample shade and even have their own head. All dive gear, tanks and weights are stowed on the dhoni, which is fully self-contained with air and nitrox compressors to fill tanks between dives. The full benefit of the dhoni is realized in the peace and quiet on the liveaboard from the lack of compressor noise. 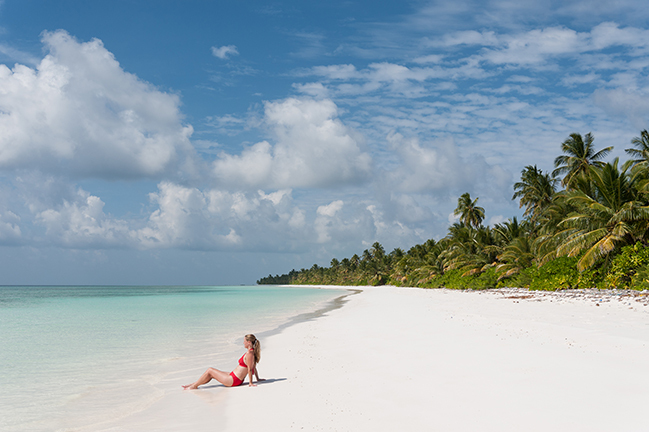 The Maldives feature hundreds of deserted islands, looking like something straight off of a postcard. One glance and it is easy to imagine walking hand-in-hand down a white sand beach with a loved one, without another living soul in sight. A scene seemingly plucked from the pages of a romance novel or the daydreams of a young girl’s future honeymoon. It is no wonder so many couples choose to get married and/or honeymoon here. The beauty, isolation and serenity of these islands are incredible. Traveling by liveaboard, we passed untold numbers of these picturesque exotic islands and secluded sandbars. Occasionally stopping for a stroll on the beach, a relaxing snorkel in between dives or a lavish BBQ at the end of the day. The waters around these island oases are crystal clear and a magnificent shade of blue. As you come ashore, it is easy to imagine that you are the first humans to visit this tiny portion of our blue planet. Sadly, even if you truly were the first person to set foot on that island, evidence of human existence would have long preceded you ashore, in the form of marine debris and plastic trash. Most of the beaches I visited were littered with plastic water bottles, utensils, Styrofoam food containers and flip-flops. It was a somber reminder that our everyday decisions have a global effect on the planet. Diving in the Maldives is synonymous with currents and the varied reef structures provide for a multitude of dive profile options. For the adventurous type, diving at the kandu can provide an action-packed thrill ride and a fantastic show. If done correctly, the divemaster will position your water entry so that you drift with the current down to the mouth of the channel, where you will hook in, flying like a kite, as several varieties of reef sharks, large schools of fish, rays, Napoleon wrasse and even the occasional whale shark appear out in the blue. Negative buoyancy entries and the drag of a large camera housing can make this type of diving even more of an adventure. While navigating the Southern Atolls, you will experience one or two of these dives daily as part of your three-dives-daily routine. After unhooking from the mouth of the kandu, the current will sweep you into the channel where you will pass walls of coral formations along the edges and isolated reefs growing out of the sandy bottom. 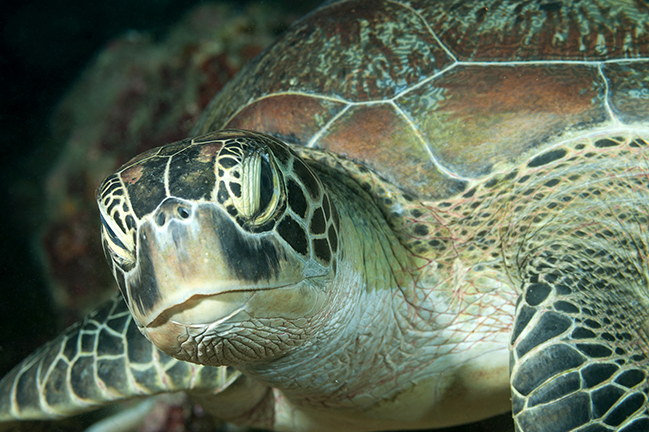 Here, you will pass smaller reef fish, eagle rays and lots of turtles. Occasionally, it will be possible to swim into an eddy in the current, hide behind a large coral head or even rehook into the reef for a closer view, but often, the current will be too strong and you will simply have to enjoy the ride as you watch the reef rush past. Farther into the channel as the current subsides, there will be more time to inspect the reef and its multitude of inhabitants, so long as you have sufficient air left in your tank. Diving within the atoll and the protection of the outer reef usually provides for weaker currents and easier dives. Astonishing coral formations comprised of massive species of plate corals, staghorn corals and enormous coral domes create the backdrop, as you leisurely drift along, inspecting the incredible diversity living in and around these reefs. When you visit the Maldives, bring along your sense of awe and wonder, be prepared for a little romance (whether real or otherwise), and don’t forget your adventurous spirit. The beauty of this country, both above and below the water, will impress even the most seasoned traveler, but you may have to work a little harder to appreciate all she has to offer. The author would like to thank Luxury Yacht Maldives (http://www.luxuryyachtmaldives.com) for their incredible hospitality as a gracious host on this adventure. 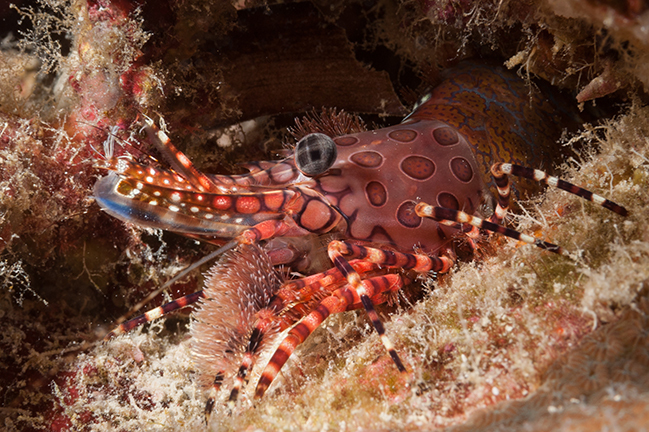 He would also like to thank Scubapro (http://www.scubapro.com) and Blue Abyss Photo (http://www.blueabyssphoto.com) for their assistance with underwater photo and dive gear. Matthew Meier is a professional underwater photographer and travel writer based in San Diego, California. To see more of his work and to order photo prints, please visit: www.matthewmeierphoto.com.